Artemesia absinthium ‘Lambrook Silver’ is a member of the Asteraceae family and can be found in the Herbaceous Border. Artemesias are aromatic evergreen or deciduous shrubs, usually with silvery foliage. Artemesia absinthium ‘Lambrook Silver’ is a particularly fine cultivar with finely divided foliage that is probably the lightest in colour of all the artemesias, being a soft silvery grey. It grows to about 1m in height and should be cut back to 15cm in the spring to encourage new bushy growth, as these plants can become quite lax in habit. As the flowers are quite insignificant, the flower stems can be removed before flowering again to encourage a bushy habit and new silvery foliage. This plant prefers nutrient poor soil that is well drained, in full sun, and can be propagated by greenwood cuttings in summer, cuttings that are still soft. 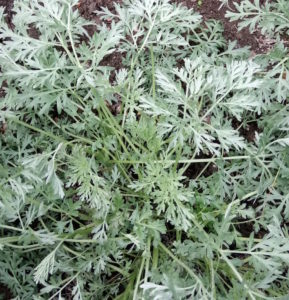 Artemesia absinthiums are known as ‘Wormwoods’ and are used to flavour vermouth and absinthe.